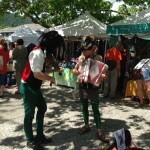 Salt Spring Island offers visitors many events throughout the year. Events range from eclectic to folksy to internationally-recognized and the venues are equally varied. So, if you are thinking of coming to the island, why not combine your stay with one of these typical island events. Pitchfork Social Featuring world class Americana and Roots music concerts from May to October at a unique music venue in a forest setting just 5 minutes drive/15 mins walk from Hedgerow House . There is an outdoor kitchen offering delicious meals before the concert in a picnic setting. Make an evening out in this very special space.This is a house concert with a difference : Warning: tickets sell out fast !! Check the 2017 schedule of concerts on the website. Cowboy Junkies are coming back ! Salt Spring Folk Club: From October to March the Salt Spring folk Club stages a wide variety of local as well as national and even international folk music shows at the historic Fulford Hall. Check the schedule and combine your trip to the island with a visit to this quintessential Salt Spring experience. Farm to Table Dinner Series May – June : Four farms, four chefs & one great dinner. Come down to the farm, sit at long tables and enjoy farm fresh food and great atmosphere. In addition there are a number of other farm to table dinners such as at Stowel Lake Farm, and Bullock Lake Farm which highlight the bounty of food available on Salt Spring Island. Art Spring Theatre Throughout the year the main theatre in Ganges features an eclectic mix of cultural events including plays, chamber orchestras, and jazz. Check out our seasonal cultural stay and save packages in combination with specific Art Spring events. feb 14 Valentines Day ! The most romantic day of the year = perfect for some island relaxation !! May 19 – 21 Salt Spring National Art Prize (SSNAP) art auction fund raiser at Mahon Hall. Every Tuesday: The Salt Spring farmers market starts June 6. 01 July Canada 150 festivities in many locations including fireworks over Ganges Harbour. Art & Nature fest at the Salt Spring conservancy at Blackburn Lake. 02 July Art in Nature Festival , Salt Spring Island Conservancy, A wonderful day of art, music, great food in a bucolic setting around Blackburn Lake. Check back for details. July 16 Outstanding in the Field Farm to Table Dinner at Bullock Lake Farm. Sept 9 Pride Festival: One of the largest pride parades in BC. Join the colourful festival celebrating gay pride. Sept 19/20 The Fall Fair at the Farmers’ Institute – one of the largest fall fairs in BC – a 119-year-old tradition celebrating everything to do with farming and artisan traditions on Salt Spring Island. Lots of entertainment and good food plus lots of fun. Zucchini races anyone? Celebrate Canada 150 with 150 days of fun throughout the island. Oct 1 The Apple Festival Check out the 350 varieties of apples at Fulford Hall and at many apple farms throughout the island. Sample fruit and try some apple cider.